Well, I don’t have all my gfe “spring cleaning” behind me as I had hoped I would before I kicked off this year’s March Muffin Madness event, so I’ll be alternating muffin posts with other giveaway posts. Hope you won’t mind! 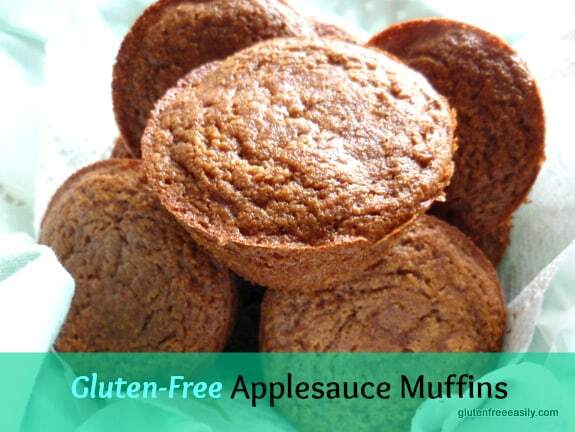 Today I’m sharing my new recipe for gluten-free Applesauce Muffins. So much of what I make in my house is inspired by what I have on hand. That’s true even when I’m creating or including recipes for a series, such as this March Muffin Madness event. I like to show folks that baking/cooking gluten free is really not rocket science; it’s just combining ingredients to a tasty end. Such was the case when Son popped in last weekend and was looking for something sweet to eat. When I peeked in the pantry, lots of unsweetened applesauce was staring at me. I’m out of my Two-Ingredient Gluten-Free All-Purpose Flour Mix and haven’t been in a hurry to pick up the ingredients to make more. I had plenty of almond flour and Son eats grain free most of the time. That’s my preference, too, at the moment. But at the last minute, I decided to throw in a little oat flour that I had in the fridge to give the muffins a tad more heft and keep them from being too moist with the large amount of applesauce. 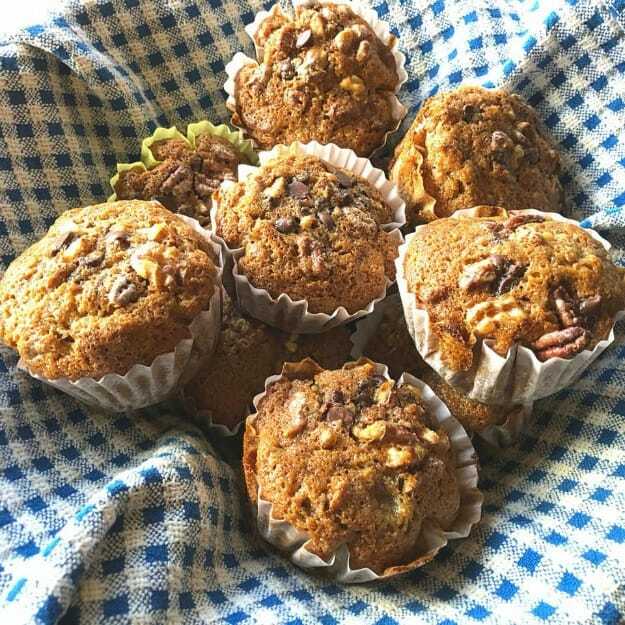 I had taken a peek at Linda’s (Gluten-Free Homemaker) gluten-free Applesauce Muffins recipe and while hers was a bit different in composition than what I had in mind, I liked that she used toasted nuts. Suddenly, I remembered Hail Merry’s Orange Rosemary Pecans that I’d been sent to review. I already knew that I liked these flavored pecans as standalone treats, but how would they taste in an Applesauce Muffin? Well, the answer was “perfect!” but honestly I’m certain this recipe will taste great with any toasted nuts added. Son and I enjoyed these muffins for breakfast and he took the rest home with him. It’s a recipe that I’m sure that I will make again and again. In fact, I have made these muffins again and again. Especially for company. 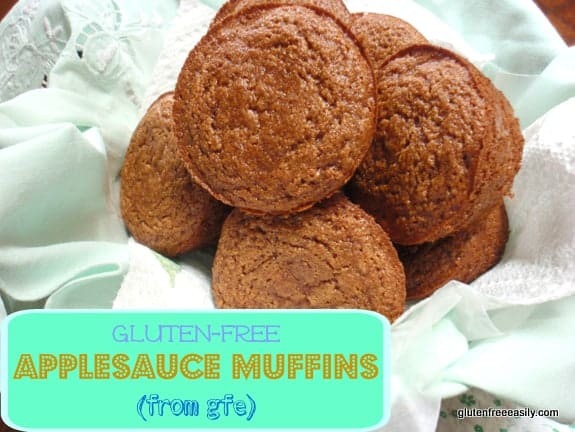 Everyone seems to love these gluten-free Applesauce Muffins! Would you like to make these muffins? 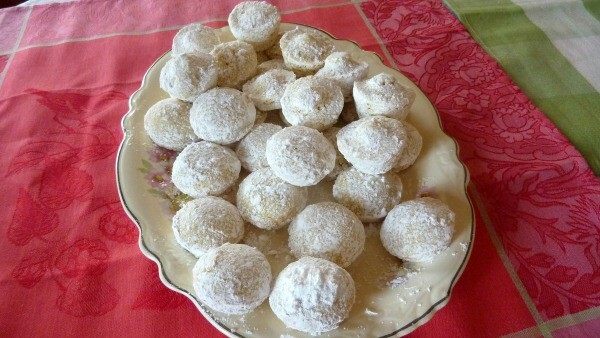 You can see the recipe further down below, but perhaps you need some almond flour to make them? 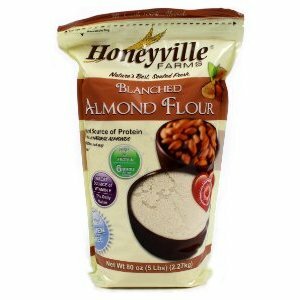 I’m giving away a 5-lb bag of Honeyvile Blanched Almond Flour to one lucky gfe reader! UPDATE: The giveaway of the 5-lb bag of Honeyville Blanched Almond Flour is now closed. 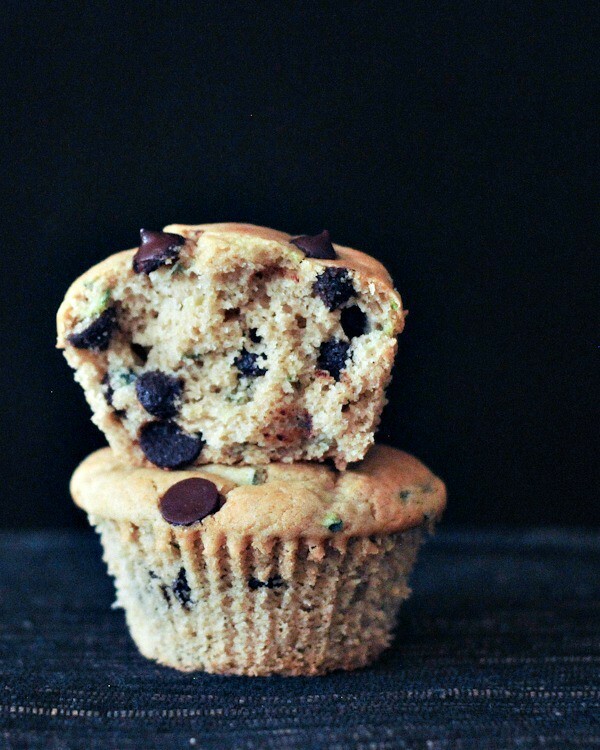 Update: You can see the complete March Muffin Madness recipe roundup here. 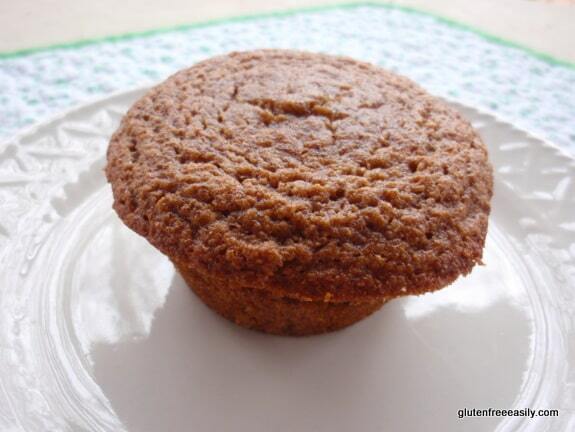 These gluten-free Applesauce Muffins score big in both the healthy and delicious categories. They're loved by both family and friends! Preheat oven to 325 degrees Fahrenheit. Grease or line muffin cups with liners. In a large mixing bowl, mix wet ingredients. Stir in dry ingredients. Bake for about 18 minutes. If liners were not used, let cool in muffin tin about 10 minutes before removing to wire rack to cool. If using large eggs versus extra large eggs, you may be able to reduce the amount of coconut/palm sugar just a bit. If you don’t eat oats, feel free to use quinoa flour or quinoa flakes that you have blended into a flour-like consistency. Personally, I don’t care for quinoa flour, but I like quinoa flakes, so I usually just run mine through my mini-chopper until the consistency is finer. Originally published March 26, 2012; updated November 26, 2108. Almond flour muffins? Yes, please! These look yummy! I’ve been eating mostly grain-free lately so I’m pleased to see them. And I can ALWAYS use more almond flour! Ooooh, these look yummy! I’ve recently gone virtually grain free, in the hopes that some lingering symptoms disappear, so that bag of almond flour would really come in handy – thanks for the chance to win! These muffins look great! Can the eggs be substituted? Hi Wanda–I’m guessing the eggs *possibly* can be substituted using flax eggs or chia eggs, but since there’s so much applesauce in this recipe already, I wouldn’t use that particular substitution. 😉 Bananas might work, too. Not sure. Please let us know if you give any of them a try and what the results are—good or bad. I’m hoping for good though! Look delicious! What can I use in place of coconut or palm sugar? Love almond flour! Hi Jayne–You can sub regular granulated sugar for the coconut or palm sugar. And *probably* even brown sugar or a mix of the two. FYI–The coconut or palm sugar gives more of a brown sugar flavor, but its texture is more like granulated sugar. Adding this to my list of things to try! I have some almond flour that needs to be used up soon. Awesome giveaway! I follow in a reader. YUM! I also follow in my reader. I like the idea of combining almond flour with ground quinoa flakes for a lighter texture. Thanks. We love almond applesauce muffins, GF donuts, etc! Will try these this weekend! 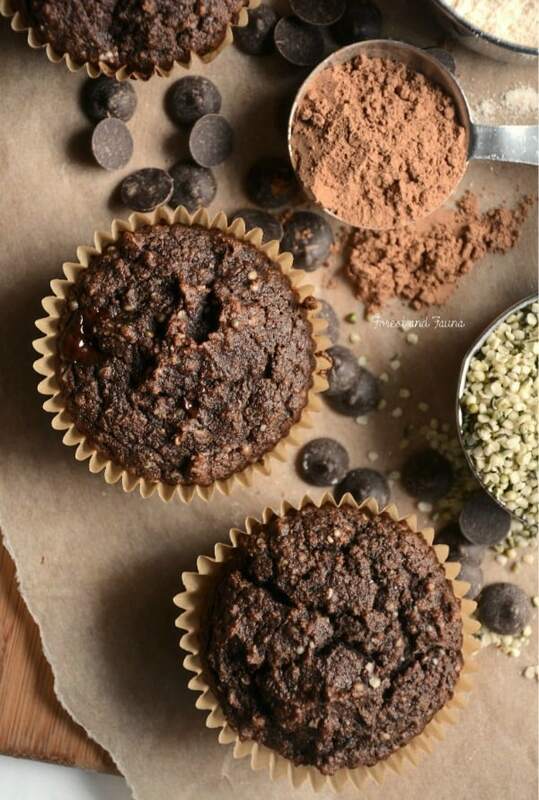 I started eating grain-free about a month ago and these muffins sound delicious!! These sound delicious. Will make soon. The only almond flour/meal i’ve used is the bob’s red mill brand. I’m going to look out for this one if I don’t win! I am a sucker for muffins Shirley! Applesauce is one of my fave muffin ingredients 🙂 Yours look lovely, lucky Son. Can you believe I have yet to try Honeyville Almond flour!? I am loving this recipe and all of the health factors involved. And now you totally have me intrigued to try out some of the Hail Merry products! Those orange rosemary pecans sound unbelievable (and perhaps dangerously addictive). Miss you like crazy, my friend. Slowly catching up with everything this week, though! These look good. I hope to try them in the near future. I follow gfe on FB. This recipe looks good. I like that it has ingredients that I usually have on hand and use often. I get your emails, love them! These look delicious, Shirley! I’ve never used coconut sugar…. I wonder if it’s available at Whole Foods? I’d love to receive the Blanched Almond Flour! How nice! I used abt 2/3 Cup of GF dry oatmeal (instead of Oat flour) and 1 teaspoon of psyllium to give them a little ‘stretch’ and they were great! Shirley, I find psyllium either at my local health food store–and now even the local grocery chains (Shaw’s or Hannaford) carry containers of psyllium husk. Before going gluten-free I used psyllium as a fiber supplement and now I use it as a baking additive–who knew it was so versatile! Keep up the great work! I love your site!! Hi Al–It look like you are new here–welcome! 🙂 Thanks, too, for the psyllium info, as well as the kind words. I’m not sure our local stores are advanced enough to carry psyllium, but I will inquire further for sure. If psyllium can work the magic you and so many others say that it does 😉 , I must have some! I’d love to try the Honeyville almond flour. I’ve been using Bob’s Redmill, but pretty much everyone seems to feel Honeyville is much better. Suzanne–Once you try Honeyville almond flour, you won’t even refer to Bob’s Red Mill as almond flour. They are worlds apart. Thanks for the new recipe to try! I would love to try almond flour in my gf baking. Thanks! I’ve seen others recommend this brand and I have yet to try it. Hoping to win and try it out. I can’t wait to try these muffins, they look yummy! You bake like I do – with the whole “what do we have kicking around here?” mentality! I love it. And I love these muffins – they sound hearty and delicious. These are amazing, Shirley! Your ingredients are fantastic. Great job! I really like the direction you’re going with you recipes. Sharing these for sure! Yum, those muffins look wonderful, and so does the almond flour!! id love to win, thanks!! 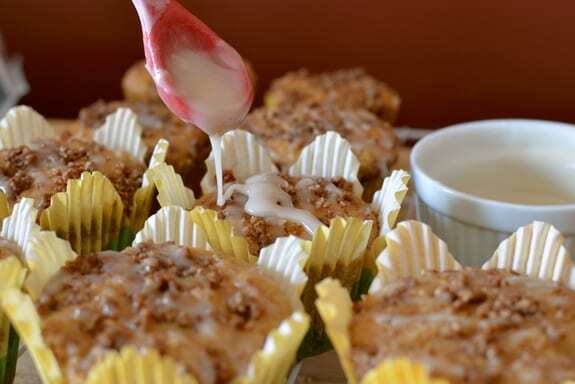 I love how moist applesauce makes these muffins…mmmm, marvelous! This recipe seems to have come at exactly the right time for me – I have been eating mostly grain free for a couple of years, but here in the UK there are very few good resources for recipes, it seems the US is leaps and bounds ahead. I have even put away my scales, and now mostly use cup and spoon measures rather than attempting to convert everything. Only today, due to the lack of ‘unsweetened’ apple sauce here, I have stuck some apples in my slow cooker, (US = crock pot?) and got my preserving jars ready to fill up with the appley goodness! Hey Louise–I’d call all that serendipitous for sure. 😉 Many of my friends make their own almond flour using their spice grinders, coffee grinders, or food processors (just don’t over process or you’ll have almond butter instead). They like being able to make it as they need it and not having to store large amounts of almond flour in the fridge (or freezer). Thanks for the great tip, Shirley – it just so happens I have replaced my broken food processor with one that has a ‘mill’ attachment, so I will do that. However I’ve read something somewhere about how we need to soak nuts overnight to get rid of something in them that makes them harder to digest (I forget the word). Would you do this then dry them before grinding, or just use them straight out of the packet..? Hi Louise–I don’t know that folks soak nuts before making flour, but it’s a good question. Maybe some others will weigh in. Hope so! If the nuts are blanched, they dont “need” soaking. The inhibitors are in the skins. If you soak the nuts, yes, you would need to dry them out completely, before grinding. I personally find sprouted (soaked and dehydrated) nuts to be *more* difficult to digest…so I stopped doing it. I would love to make these but can’t find almond flour. Gaile–If you’re in the U.S., I recommend ordering it from Honeyville’s site (honeyvillegrain.com) or Amazon’s site for larger amounts. Nuts.com also offers almond flour in 1-lb packages if you want to try some out first before buying a large amount. Or as I was just saying to Louise, you can pretty easily make your own. Many of my friends do. They don’t worry about the skins of the almonds. Those get ground up and just make for a slightly nuttier texture with the little bits that don’t get ground fine like the rest of the almond does. If you are near a Trader Joe’s, and don’t mind the dark skin specks in the flour, I suggest going there. Best price I’ve seen anywhere. $4-something a pound, here. And it is ground just as fine as Honeyville…if not finer. Bob’s Red Mill (in some grocery stores) is “eh, ok” but kind of chunky. I’m still in gluten free baking 101 mode and I’ve never tried almond flour since I’m getting acquainted with the chemistry of baking. I love to bake and hope some day to try almond flour recipes like the one today that sound delicious. I have been wanting to try honeyville almond flour. Thanks for this giveaway ! I “like” GFE on Facebook. I “follow” GFE on Twitter. My kids are crazy about applesauce. I love it in muffins-makes them so moist! Thanks for another fabulous recipe Shirley! Thank you for your receipe! I have never used Almond flour and can’t say I have seen it. These look like an easy recipe to use for teaching my kids how to bake – quick question though – do you scoop spoonfuls of almond flour with a spoon into your measuring cup, or do you usually pack the flour into the cup like brown sugar is typically measured? These look great and I have all the ingredients on hand! I’ve been thinking grain free may be my next step but I’m not quite there yet! Its a process. Thank you for all you do! Your web site is one of my favorite! Can’t wait to try the muffin recipe. Awesome. I can’t get enough muffin recipes for my picky eater! Thanks so much for the awesome recipe! I have yet to find almond flour for a half decent price. (I ground my own for another recipe). I wonder how it would taste with coconut flour. I am a huge fan of coconut oil & coconut sugar…I’ve just recently started baking with them & love the taste. 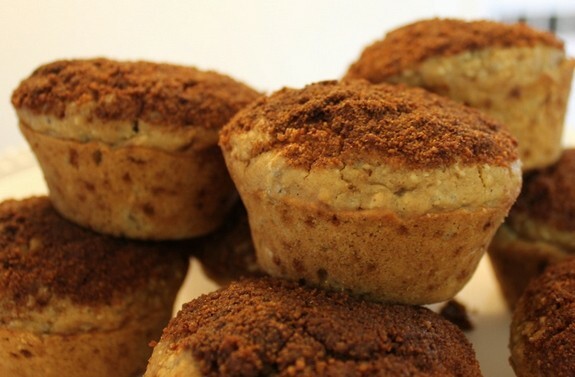 I’m going to try the recipe in my special needs cooking class (using almond flour)…they LOVE muffins!! TY! Looks very tasty. I wish we had some applesauce lying around, because I have everything else! Don’t know if my almond flour is as good for baking as the stuff you’re giving away. YUM. Would love to win!! These muffins look wonderful Shirley. I’m putting them on my “to try” list. Just have to buy a few ingredients! These look So Yummy!!! Thank you for your notes, on using the quinoa flakes to replace oats. I would have just passed this one up. In recipes that ask for oats, can you replace the quinoa flakes instead? Hi Michelle–Many, many of us use quinoa flakes instead of oatmeal and ground up quinoa flakes instead of oat flour. As long as you get the same consistency that’s intended in the recipe, it should work perfectly 🙂 Good luck! Let us know what you think! I receive your emails and always look forward to them. Thank you for all your “help” with my GF baking!!! Shirley…thanks for answering my question! I just did an hour of cardio and strength training and was sitting at my kitchen counter trying to decide what to make for breakfast when I read your post. I’m off to make these muffins right this second! Thanks! They really look good AND I have all the ingredients! These look lovely, and I bet the combination of almond flour and oats with the applesauce and nuts is delicious. I’ve heard so many great things about Almond Flour for years. Been meaning to try it but haven’t yet. Thank you for the opportunity! I can’t wait to try this recipe! I have been going through almond flour like crazy so it would be awesome to win some. I’m already an email subscriber, too! These look great – love the addition of the toasted nuts! I cannot wait to try these muffins. Thank you for sharing the recipe, Shirley. What a great Mom you are, your son is blessed. I have been wanting to try that almond flour. Thanks for the recipe, I’m looking forward to trying it. These sound so good! I can’t wait to try the recipe. I follow your blog via email–love it! Love both almond and applesauce so these sound amazing! I’m guessing they’d be amazingly moist as well,yum. I wonder if you could substitute coconut flour for the oat flour. And is oat flour just finely processed GF oats? Hi Janet–Yes, oat flour is just finely processed certified gf oats. You can easily make your own in food processor or mini chopper. 🙂 I would not substitute coconut flour for the oat flour though. Even a small amount of coconut flour is highly absorbent. For example, I only use 2 tsp in my Brazilian Un-Cheese Rolls recipe and that’s enough to zap up quite a bit of liquid and make them chewy. This recipe would have to be adapted quite a bit (with more eggs and/or other liquid) to accommodate coconut flour. I am a follower…would love to try this! Thanks for the opportunity!! These look delicious. I cannot wait to try them. I Would really love to try the almond flour as I heard it is the best. I have cut out a lot because I cannot find it to try it! Shanna–I find the best source for almond flour to be online at Honeyville’s site, Amazon, Digestive Wellness, Nuts.com, etc., but as I was saying in other comments, many of my friends make their own almond flour using their spice grinders, coffee grinders, or food processors (just don’t over process or you’ll have almond butter instead). They like being able to make it as they need it and not having to store large amounts of almond flour in the fridge (or freezer). I now follow your blog through email. Anything with coconut oil and almond flour has to be good! Can’t wait to try your recipe! Thank you! These muffins look so moist and tasty. My go to flour is almond flour. 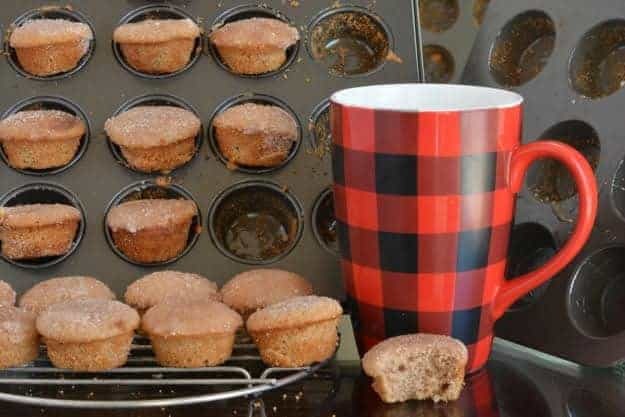 I’m a simple baker and I haven’t tried applesauce muffins before but I will give these a try. Thanks Shirley for inspiring me, as always! Recipe looks yummy! I would love to try the flour!!! The only ingredient I don’t have is oat flour. Will rice, potato or chickpea suffice? Your recipes look delicious! I have been looking into gluten-free sugar-free dessert recipes for my dad and have found several that require almond flour which I have never heard of before. It’s awesome that you are willing to give away a bag! I have been wanting to try honeyville’s flour to see how it compares! Haven’t tries almond flour yet. Here’s a question, does it taste super nutty when you bake with it? I love almonds, but my girl who needs to be GF not so much. Would love to get some to try. Thanks! Honeyville doesn’t have an almondy taste. These muffins look great and i just so love almond flour. i use almond flour all the time and would LOVE to win this….thanks!! 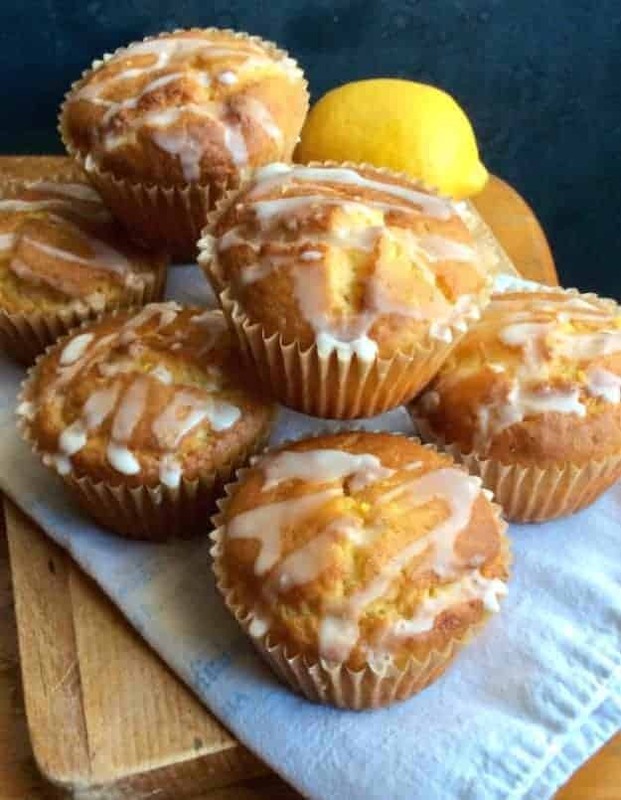 I’d love to win so I could make these delicious looking muffins! I have used Honeyville almond flour before and like it. These muffins look delicious. I love using almond flour. You don’t get the gritty taste in your baked goods, that you get with some of the other grain flours. I haven’t tried Honeyville yet though. I will have to look for it next time I go to the store. I get your blog through email. Keep those yummy recipes coming! The recipe looks awesome and I’m dying to try is flour! Mmmm… Your recipes inspire me! I haven’t tried almond flour yet, but these muffins look so good I may have to. My daughter’s coming home next weekend and with so many yummy recipes, I’m thinking a muffin “bake-athon” is in order. I love almond flour!! 🙂 These muffins look really good, too. I love almond flour and I can’t wait to try this recipe.Thanks! 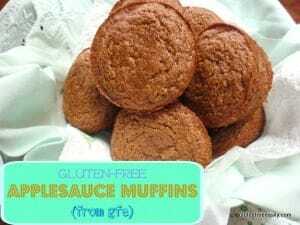 Applesauce muffins (we love almond flour in nearly anything!) may become one of our top 10 “try this, gluten free can taste really good!” Thank you for all that you do to encourage us in the new walk! Hi Carol–It looks like you are new to gfe–welcome! 🙂 Thanks so much for the kind words, and you already know I love your “try this, gluten free can taste really good!” approach. 😉 Bravo! Hi Ashley–Welcome to gfe! 🙂 Congrats on going gf, too. It can be life changing in many ways. 😉 Almond flour is a wonderful thing for sure. As far as where to start, I suggest checking out my gfe tip sheets and looking at the sidebar for essential posts and most popular posts. I hope you’ll find both very helpful, but email me with any questions specific to your family. These muffins look divine! Just added applesauce to the grocery store list. I’d like to try baking something with this! Yum! I’ve been on a muffin cake lately. Thanks so much for sharing at Allergy Free Wednesday! I hope you’ll come back tomorrow. Very popular muffins you have here, Shirley! They are amazing. Thank you for sharing this great recipe with us last week on AFW! Be sure to check back this week for reader favorites and hostess picks. Thanks for doing all the work for us and thanks for your creative recipes! I’d love to try this recipe, can you recommend a tree nut free (almond flour) option? Thank you! Hi Krisztina–What a lovely comment to read first thing this morning! 🙂 I’m so happy that these muffins turned out so well for you. Thanks so much for taking the time to leave your sweet review and welcome to gfe! Thanks for another simple but tasty looking recipe. Looks so good I wish I had one now! I have a large jar of applesauce that I need to use and I think I just found the recipe to do so! These look delicious! I have a recipe for applesauce bars that I might try to adapt to be gluten free, using this as inspiration. Thanks! Beautiful muffins Shirley! I’m featuring them on Savoring Saturdays this week! Thanks for linking up! Hi Ali!–I’m so honored … thank you so much! 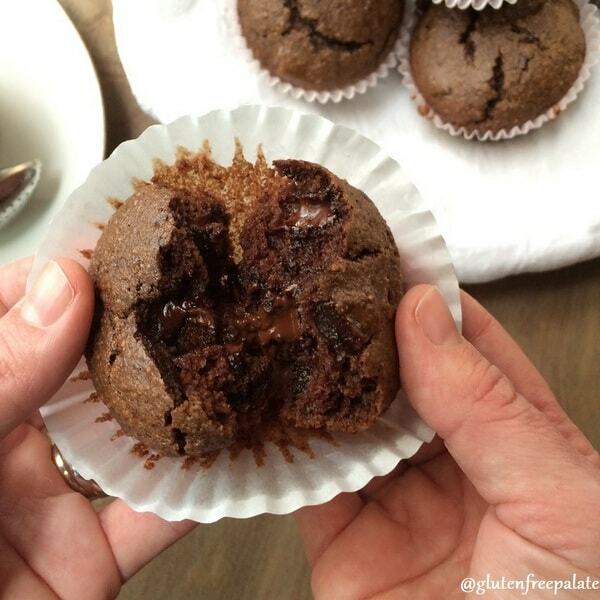 I really appreciate you hosting Savoring Saturdays and sharing my muffins everywhere! 🙂 Happy Halloween weekend, dear. I made the applesauce muffins with my daycare children. They wanted yellow raisins and roasted unsalted sunflower seeds in them. They were YUMMY, the kids would have eaten them all at one time if I let them. Thank you for sharing your wonderful recipes. The parents of my daycare children are amazed at what these children are learning through this gluten free journey with me. We bake every Monday morning. Now everything we make is gluten free. The children get to taste all the ingredients and the finished product as well. They are learning about eight different types of flour that we are using. Whenever they eat something they ask if it is gluten free. They know I can’t put anything gluten free in my mouth and they ask me if what I’m eating is gluten free. If you were to ask the two year old boy I have in care what happens when Grammy ( that’s what they all call me) eats somethinwith gluten he would tell you I get sick or that I have diarrhea. These children are totally amazing! I forgot to tell you that they each take turns measuring ingredients before we mix everything together. They have such knowledge about baking from doing this each week. Cathy–Reading more about your wonderful daycare kids and how you’ve taught them about gluten-free living and looking out for others makes me so happy! It’s really so important to instill these attitudes early in life. Btw, you might want to read another post here on gfe–a personal story that is very similar to yours. 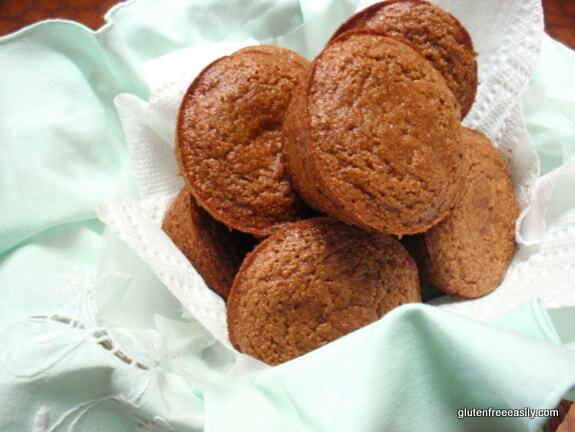 Hi Shirley..I have loved this recipe for years…and today I used it to make Peanut Butter muffins. I just subbed out the applesauce for peanut butter, and took out the spices and put in 1tbsp of vanilla. DELICIOUS!!! Hi Meg–Oh how I love your variation!! 🙂 I will have to make your variation and if I post it, I will tell everyone it is your brilliant creation! I’ve been in a muffin mood but too busy to make any lately, so I’ll try to get on it this week. 😉 Thanks so very much for sharing!